In order to successfully convert someone to the dark side, things must be subtle, camouflaged, yet immensely inspiring. 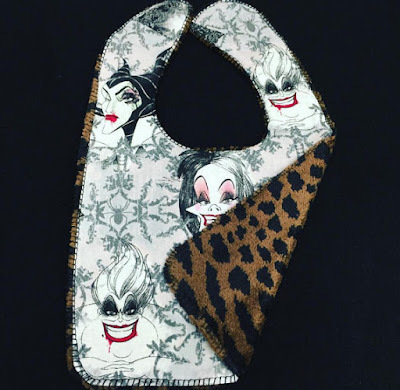 I feel that a nice starting point is this Disney Villains Bib . 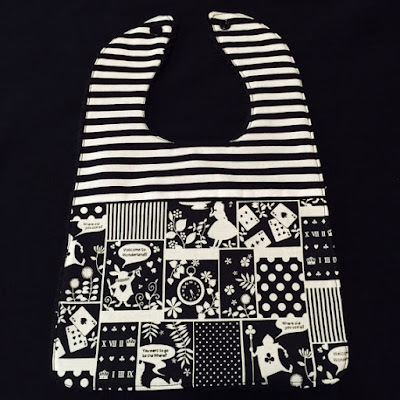 It is double sided and made to order. Notice how it has leopard print on the inside?(yuck!) My sister will overlook my actual intentions since the leopard print is a nice distraction from the actual dark goth style Disney villain artwork on the front. The only color that is actually apparent is a nice red color highlighting the truly malevolent forces at work! My niece has no hope! I hate to admit this, but I really want this Alice in Wonderland Bib for myself. I would have to wear this only while I'm alone, my friends would give me so much flack otherwise. This bib has little silhouette scenes from Alice in Wonderland. There are panels of the Cheshire, the White Rabbit, the Cards chasing her. Again, this is a very subtle way of indoctrinating little children to the dark side! 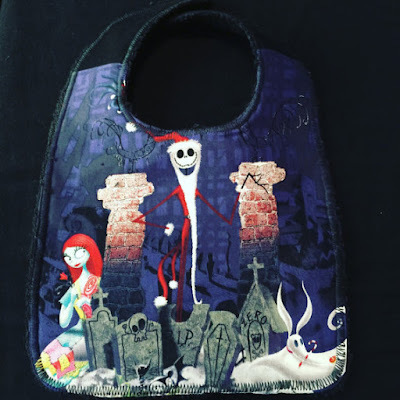 Since Christmas is so close by, I feel that this Nightmare Before Christmas Jack in Santa Suit bib. was appropriate. This one is perfect for the holidays coming up and it's awfully cute. I can't really help myself, in fact, it should just be at my house for all to enjoy. I love Jack in the Santa uniform. Of course Sally is in the background of the graveyard looking toward Jack lovingly, while Zero is close by Jack's feet holding a candy cane. The style is cute and innocent enough! The rest of these will clearly be for auntie's house. My sister would never let me get away with giving her daughter any of these, but they would be wonderful for my place! 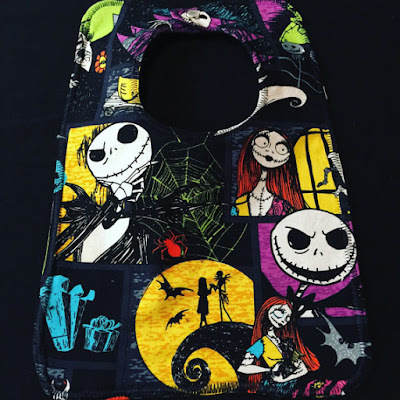 This Nightmare Before Christmas Bib is so awesome! It features bright colors, but a very sketchy style of art. 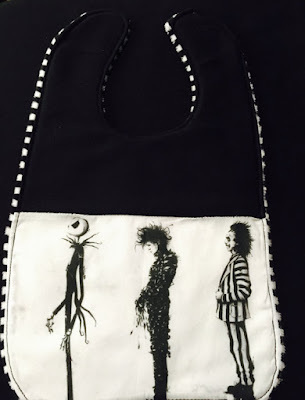 The fabric features all sorts of scenes from the movie including Sally, Jack, and the Spiral Hill. I can already see my niece wearing this one with so much pride! There is no way she won't know about The Nightmare Before Christmas. My sister would be lying if she said she didn't enjoy the movie even a little bit. 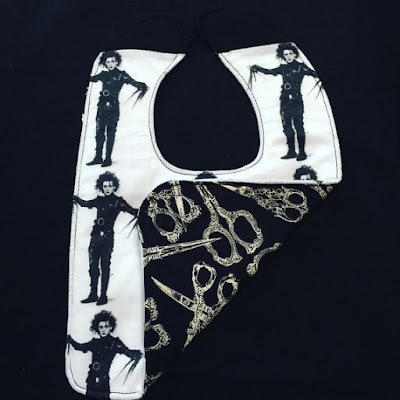 With the Edward Scissorhands 25th anniversary upon us, there is absolutely no reason I shouldn't celebrate by purchasing this Edward Scissorhands Bib. Maybe I could get away with getting one for myself, watch the movie, and eat some delicious chocolate covered cherries to celebrate! I could spill with absolutely no guilt! Well actually, I would feel guilty, because I think this bib is actually really awesome and would hate to ruin it. I can't get over the black and white scissor fabric that's on the other side. It's hilarious! Lastly, but definitely not least is this Jack, Edward, and Beetlejuice bib ! Give it up for the all stars! I couldn't help but think this was a prison line up! It made me laugh, but it's actually really a cool concept! I love that three of my most favorite fictional characters are just lined up on this bib! This is should be in every goth lover's home, but honestly I would rather have a shirt with this exact line up! If anyone sees such a thing, let me know down below! I'd love to hear from you guys! Happy shopping! A Very Scary Cthulhu Christmas!